Framed kimono stencils homeowner Susan Crowl found at a Paris street market and figures by an Italian artist decorate the mantel. The new cushions (in Lombardo Zinnia velvet) and marble-patterned custom pillows on the antique daybed are upholstered in Romo Black Edition fabrics. For most people, a leaky kitchen pipe is a problem. For Susan Crowl of Brookline, it was the chance of a lifetime. Crowl loves to cook for family and friends but had never loved her kitchen. It was in good shape when she moved in, though, so she could never justify tearing it out. Fast-forward 17 years, and that pipe helped her realize she should seize the day. “It was my opportunity to enjoy the house before the kids are grown and gone,” she says. Crowl wanted her new kitchen to be as beautiful and special as a dining room. Casagrande transformed the adjacent pantry/laundry room into a prep room that accommodates a second oven, microwave, coffee maker, and even the fridge. She repurposed the cabinets by retrofitting them with new clean-lined fronts, then rearranging them — a fun, puzzle-like exercise. 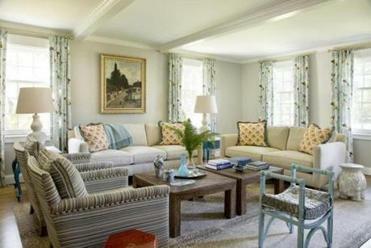 Farrow & Ball’s Hague Blue went on the walls and the ceiling, a fresh, modern treatment that adds richness and depth. The top of the new oversize island (a must-have for gatherings) is dramatic black-and-white soapstone that Casagrande likens to cookies and cream ice cream. Half a dozen brushed-brass Beat lights by Tom Dixon in a mix of shapes hang at varying heights. 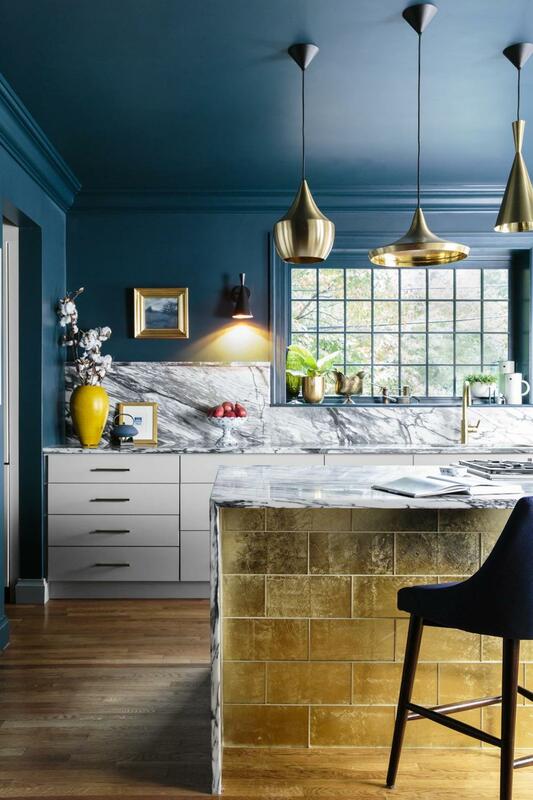 The gold-leaf glass tiles that line the front of the island are an unexpected finishing touch. A designer daughter brightens her parents Marion summer home, where they plan to retire. The glam mood carries over to the eating area. 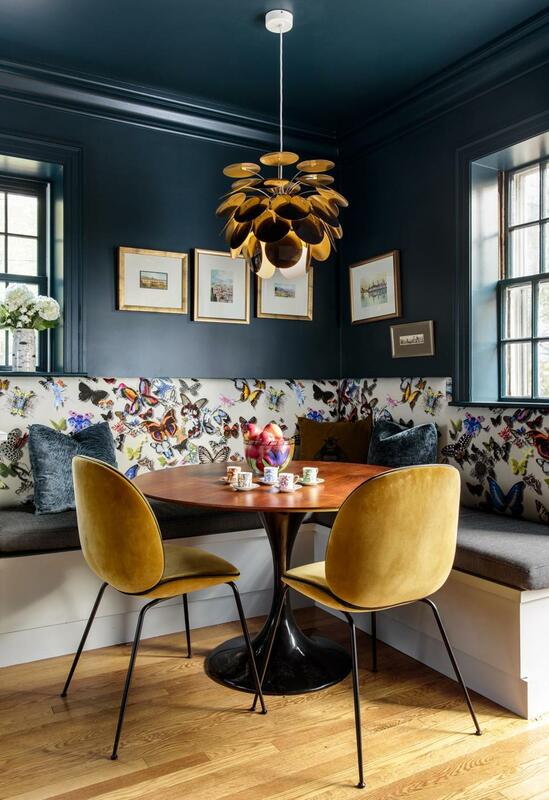 A gold-and-black Marset Discoco pendant glows over the banquette, which has cushions upholstered in a three-dimensional butterfly fabric designed by Christian Lacroix. While the kitchen devoured much of the budget, the dining room, where family dinner happens every night by candlelight, took on a whole new look with just a few new pieces. The starting point was an antique daybed Crowl bought while studying in Denmark, which Casagrande upgraded with new cushions upholstered in painterly velvet. In the eating area, Farrow & Ball’s Hague Blue went on the walls and the ceiling, a fresh, modern treatment that adds richness and depth. 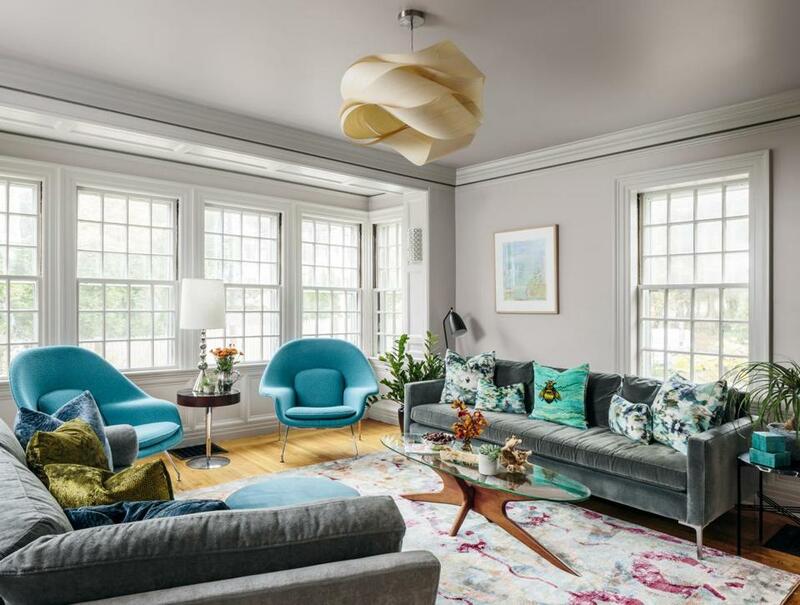 To emphasize the sunlight that pours into the living room, Casagrande chose Farrow & Ball’s Peignoir, a color Crowl says shifts from pale purple to gray depending on the time of day. A pair of Eero Saarinen Womb chairs in traditional wool boucle are the room’s big splurge. A simple sofa covered in fun pillows rounds out the seating, and an inexpensive abstract-patterned rug adds a feminine touch. 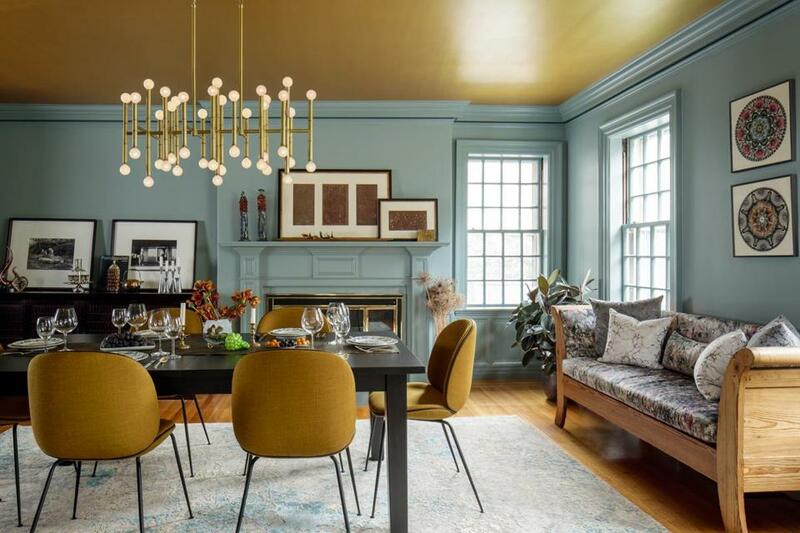 The sinuous Link beech pendant light by LZF, from Casa Design in Boston, adds interest in the living room. Davlin tiles from Ann Sacks cover the front of the island. 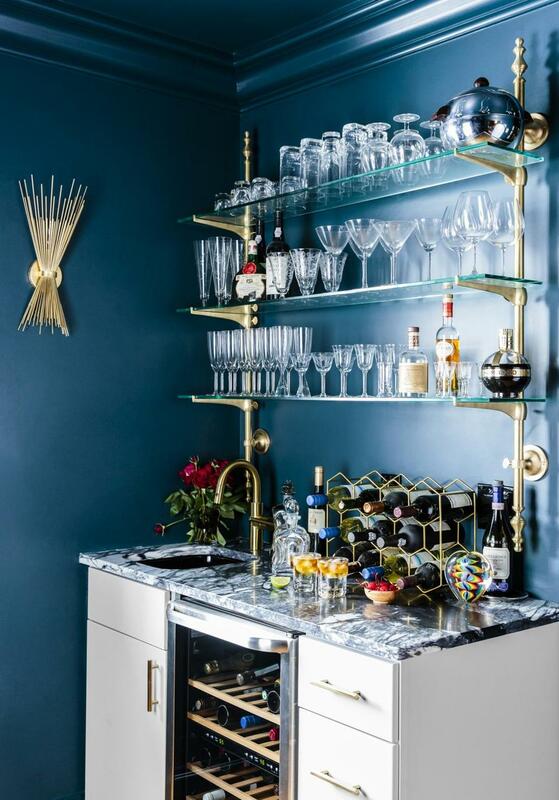 To create the wet bar just outside the kitchen, Casagrande reworked an old cabinet and added a sink and wine fridge. Marni Elyse Katz is a frequent contributor to the Boston Globe Magazine. Send comments to magazine@globe.com. Follow us on Twitter@BostonGlobeMag.